I had a really nice salmon & Caesar salad meal on an outdoor patio at The Norfolk, it was a good meal in a nice place but the service was terrible & I missed my wife. I could have gotten into Kinshasa a day earlier but enjoying the luxury of The Norfolk was a pretty nice treat. I finally got in touch with Christie through FaceTime , I had a nice shower & shave, although the water was cold. I had a refreshing dip in the warm pool after I ran on the treadmill for 30 minutes. My run was a piece of cake compared to the torture of my Addis run which on account of the altitude (it is 2300 meters above sea level) of the Guassa Plateau where Addis is situated was quite a challenge. No wonder so many world class long distance runners are Ethiopian. I did a quick lift, heavy French press & closed grip press, with a plate a side. I supersetted light bench (my shoulders are still bugging me) on the Smith machine, with straight bar curls, upright rows, & shoulder press all with a plate a side . I did some light Smith machine squats. I was hungry but I was glad to get a workout in with a swim before the fitness facility & pool closed. I returned from the police station where a big man, Justice, gave me his Kenyan police badge for $5.00 & my San Diego Chargers t-shirt. I bribed a guy named Justice, ironic. I liked him regardless, a large burly man with a hardened look. Kenya is actually pretty nice relatively speaking & by African standards from what I saw. 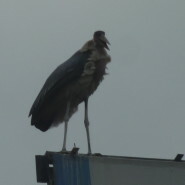 It was fairly clean not unlike a big U.S. city & they have these massive birds, huge Maribou storks everywhere in the city. It took 45 minutes to get out of the parking lot & the aggressive dog eat dog mentality of the African traffic road rules was in full effect. There were three lines of vehicles vying for one parking booth. Then we were stuck in Nairobi rush hour traffic. I initially thought this was going to be another African traffic nightmare but again by African standards it’s actually not too bad but still below the standards that I was spoiled by in Rwanda, to date Rwanda is the nicest African nation I have visited. I slept for most of the flight from Kigali to Nairobi. I loved the stay at the Norfolk, it was a pretty nice place. 11:12 a.m. I’m sitting in the Kigali airport waiting for my flight to Nairobi. I decided to get to the airport early, check my emails & get something to eat. The Internet was a problem again, the waitress let me use her phone & another guy was nice enough to help set me up but I am off line again as I sit here. I find when travelling people can be so nice extending the kindest courtesy & gestures. I tried to connect with Christie on FaceTime but between the bad connection & with the construction noise downstairs it was a fruitless effort. Roderique drove me the short distance from Centre Cesare to the airport after I said goodbye to Nicole, Sheldon & Miriam. I also said goodbye to Verdien, Alice, Martha, & Vestienne my hosts. They are the nicest family who I wouldn’t hesitate to recommend anyone stay, (the nighttime outhouse cockroaches never really bothered me I was up early, I considered going to the UTC to get online but it would have been too much of a rush.